The year was 2008 -- the last time a live thoroughbred horse racing venue in the City of Brotherly Love hosted a handicapping tournament. Back then, the place was called Philadelphia Park. Under its fresher brand today, Parx Racing and Casino this Saturday, March 28, will host its first handicapping contest in seven years. Registration for this $100, zero-takeout event runs now through 12:15 p.m. on track and from one of Parx's five "Turf Clubs" across the region. Saturday's contest is not an NHC, Horse Player World Series or Breeders Cup Betting Challenge qualifier, but strictly offers cash and other prizes. "The hope is that we can build interest in these contests again and get back to the sort of contest that has the higher entry fee necessary to cover the costs of the NHC entry," emailed Beth Coale, Phonebet manager for Parx Racing. "Right now," continued Coale, "we are taking all the entry fees and awarding them back as cash prizes, which should appeal to our local players." When I first started blogging 4-5 years ago about my weekend pursuit of a National Handicapping Championship (NHC) berth, on-track handicapping contests were few and far between, outside of a handful of spots through my local track (Monmouth Park) and a few each at area NYRA tracks. Until the emergence of online qualifying sites such as HorseTourneys.com and recent surge in on-track qualifying tournaments at Monmouth (now offering nearly 30 NHC "seats," up from 4-6 just a few years back), it seemed as if Jersey-based NHC Tour members had far fewer shots than others at the $2 million-plus NHC held each January in Las Vegas. However, and despite our inability in New Jersey to qualify for several ADW-sponsored NHC seats via DRFBets.com and TwinSpires.com, Garden Staters have a seemingly bigger menu of "drive-able" contest venues. All are not NHC qualifying contests mind you, but the list includes the Borgata in Atlantic City, Mohegan Sun in Connecticut and, now, Parx Racing and Casino. In my opinion, the handicapping contest circuit is a clear pocket of strength in the thoroughbred racing industry and one that is grossly underplayed by the media. January's NHC paid more than $2.6 million of prizes, while contests such as the Breeders Cup Betting Challenge have been highlighted on television shows such as Horseplayers. There are others less publicized within the industry but well known in NHC Tour circles, such as the Sept. 26-27 Big One at Laurel Park in Maryland, which anticipates paying nearly $400,000 of cash and prizes. a means for Parx to promote live racing at its own track, which (based on Dairy Racing Form data) attracted just 3%-8% of total daily handle from March 17-24. "I like the idea of promoting interest in our live product," emailed Coale, when asked whether incorporating outside tracks as Monmouth Park does with its Simulcast Series Challenges was considered. "Our horse population has been well rested by this brutal winter and we're ready to put on some very competitive race cards," said Coale. Even without live racing, however, handicapping contests increase business for simulcast facilities, including Monmouth Park, where a source was "safe in saying" to me that Monmouth's handle on contest days is about 25% higher than the simulcast handle when there is not a contest taking place on track. Saturday's total racing menu is robust and features 2014 Pennsylvania Derby contestant and Horse of the Year California Chrome in the $10 million Dubai World Cup in the morning, and a key Triple Crown prep, the Florida Derby, in the late afternoon. These headline races sandwich what appears to be a very playable 9-race live program at Parx, which kicks off at 12:55 p.m. ET. Participants in Saturday's $100 buy-in tournament ($60 bankroll and $40 toward the zero-takeout prize pool) must play at least 7 of Parx's races, with minimum $2 win, place and/or show wagering required and the option to bet multiple horses per race. 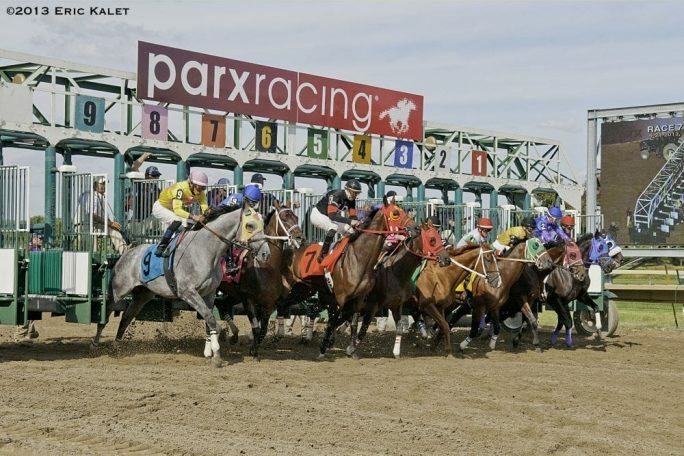 Parx anticipates attracting 200 entries across its six venues, which would provide a $8,000 prize pool where the winner gets 50% and a 46" Smart TV and Parx pays down to the Top 5. All players receive a $10 food and beverage credit and should contact Beth Coale at 215-639-9000 (extension 4215) or bcoale@parxracing.com for further details. In the event that my wife and kids follow through on their threat for afternoon theater and dinner, making it down to the Philly suburbs to test the waters this Saturday could be in my cards.